A bridge is a restoration that can be used to replace a missing tooth/missing teeth. There are two main types of bridge: a conventional bridge or an adhesive bridge. A prosthetic tooth is attached to a tooth or teeth which are adjacent to the gap. The natural tooth/teeth will require crowns to be placed on them to allow the prosthetic tooth to be secured in place. 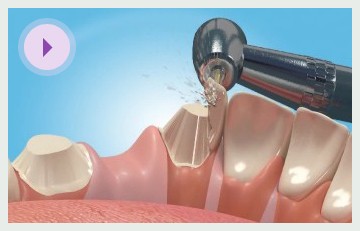 This involves quite extensive drilling of the tooth (or teeth) to which the false tooth will be attached. The crowns are either made of gold, a non-precious metal, or a combination of metal and porcelain. The false tooth is usually made of porcelain or ceramic. Once the natural teeth have been prepared, a mould (impression) of the affected teeth is made. This impression is then sent to laboratory who will construct the restoration. 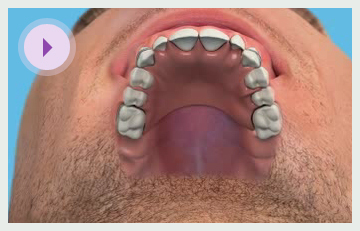 During this time a temporary bridge is placed on the natural teeth to protect them. Once it has been manufactured, the bridge will be assessed for fit and aesthetics. It may require some minor adjustments before it is cemented in permanently.